Many NPQ readers know that their fellow activists are in search of new forms for collectively achieving social good, ones less likely to replicate the very problems we seek to address and more likely to bring about the future we wish to create together. 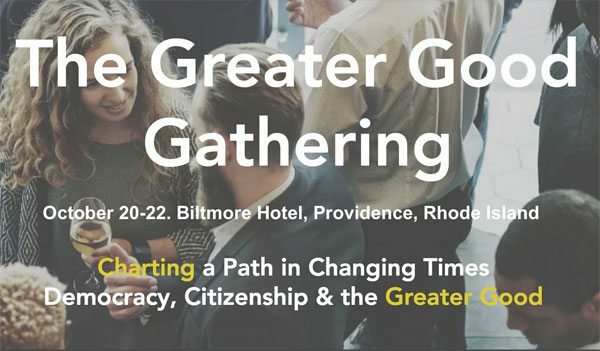 Last weekend, in Providence, Rhode Island, a discussion took place that we thought we ought to sit in on: A group of students, academics, business leaders, and activists, most either students, faculty, or alumni of Brown University, came together for what was proclaimed the inaugural Greater Good Gathering. Organized by Eric Schnurer, a journalist, social critic, public policy consultant, and Brown alumnus, the conference aimed to look “deeply and cross-disciplinarily at how the means for addressing and promoting the Greater Good may be changing in today’s world—and that includes the ‘technology’ of how we, as multiple individuals, collectively interact and govern ourselves—and how to address and adapt to those changes.” In short, the conference sought to explore what it means to pursue the public good—and how to do so—in the twenty-first century. A common thread of the conference—sometimes made explicit, but more often implicit—was seeking ways to address the obvious disconnect between the macro and micro. In short, even as our ability to address individual social problems seems to be improving, our ability to organize society democratically as a whole to achieve beneficial social outcomes appears to be waning against the scale of threat. Many NPQ readers are familiar, we suspect, with arguments about declining social capital, an argument made famous by Harvard political scientist Robert Putnam. This theme was touched on by many conference participants. But before diving into that, it is perhaps worth noting some of the innovation on display. Cliff Weitzman, a recent Brown graduate, talked about his startup Speechify, a company with an app that converts text to speech, making reading more accessible for people who are dyslexic. (It is also useful for people who have limited eyesight or who might be second-language learners.) Weitzman himself is dyslexic and the app makes it possible for him to keep up with his classes. Weitzman estimates that 800 million people worldwide suffer from reading impairment and therefore might benefit from the Speechify app. Trang Duong, a senior at Brown, is from Vietnam and is developing a nonprofit that acquires discarded prosthetic limbs from the United States and ships them to her native Vietnam, where the limbs are re-customized for new patients; this reduces the cost to the patient from a range of $5,000 to $15,000 to a flat fee of $200, which itself is waived in hardship cases. Maya Faulstich-Hon, another Brown senior, is working on developing a business that acquires organic waste (or what she prefers to call organic scraps) from restaurants and cafeterias, feeds those scraps to insects (black soldier flies) and then sells the insect protein as animal feed to farmers. This reduces farmer purchases of fishmeal—a surprising percentage of fish killed are fed to animals—and thereby helps reduce current overfishing of the oceans. In terms of the broader themes of the conference, the opening keynote speech from Martin Luther King III, son of the late Rev. Dr. Martin Luther King., Jr., set the tone by addressing the range of types of violence visited upon low income communities and the need to overcome lethargy. “Hurt and harm are more than physical violence and brute force, it is also structural violence that keeps food from people’s tables and institutional violence that withholds access to making a living and the cultural violence that denies people the opportunity to realize their potential.” He urged involvement in creating a different future through collective activism that extends beyond large rallies and high-profile speeches. King’s speech was followed by a panel moderated by Tracy Sefl, a communications consultant. The panel included Marc Dunkelman, a Fellow of International and Public Affairs at Brown; Fordham law professor Joel Reidenberg; Brown sociologist Michael Kennedy; and Macky McCleary, administrator for Rhode Island’s public utility division. A lot of the discussion focused on technology as a driver of change—both how it has disrupted the media environment (i.e., the end of the postwar era of three dominant television broadcast networks) and, perhaps more fundamentally the way people relate to each other. Reidenberg, for example, pointed out that in 1959, the Supreme Court decided in NAACP vs. Alabama that the NAACP had won the right to keep its membership list private to protect its members’ association rights; now, Reidenberg said, technology makes the privacy that NAACP members enjoyed hard to maintain. Dunkelman emphasized that technology impacts relationships, because while social media is good for maintaining close ties (such as with family members) and diffuse ties (such as the broadcast ability of Twitter), it does poorly in the middle. Kennedy, too, focused on institutions, but on their potential to address our current challenges. At the micro level, Kennedy called on Brown to act as a community-engaged anchor institution with a social mission. A Nonprofit Hosts Rep. Paul Ryan (and a Crowd of Protesters) in R.I.
A group of voters in Rhode Island decided to hold it down for those in Wisconsin who have not been able to get Rep. Paul Ryan to a town meeting lately.